For CIFF Spring-Summer 2019, under the creative direction of Kristian W. Andersen, Stavros Karelis invited Sami Janjer to co- curate ENLIGHTENMENT in the Special Projects area. Together, Sami and Stavros have enlisted Virgil Abloh, Naomi Campbell, Peter Saville, and Nick Knight to create unique pieces of work inspired by the power, influence, and beauty of light to raise awareness for the global Little Sun project. At the opening on 8 August, Olafur Eliasson and Naomi Campbell walked together through the exhibition, slowly revealing each collaborator’s work for ENLIGHTENMENT – each underpinned by the need to express and empower the importance of benevolence, generosity, and humanitarianism to a new generation. 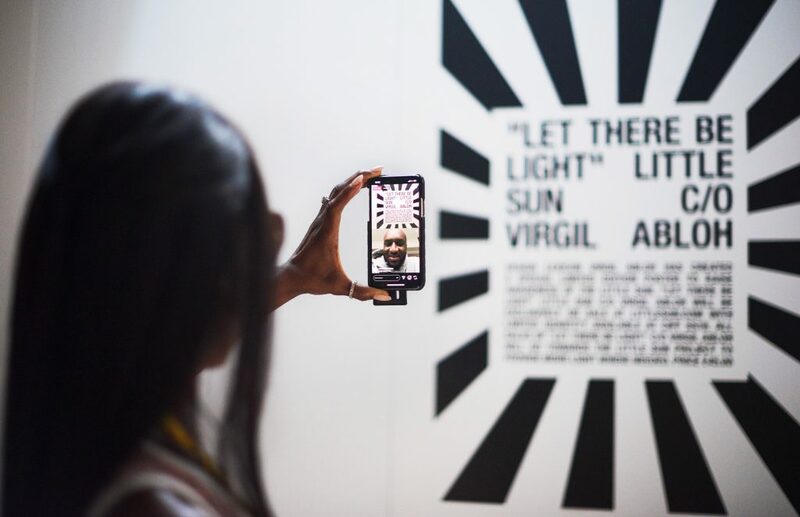 Design lexicon Virgil Abloh has created an installation with 1,000 Little Sun Original lamps and a special limited-edition poster to raise awareness for the Little Sun project. ‘LET THERE BE LIGHT’ Little Sun c/o Virgil Abloh will be available exclusively at littlesun.com/shop until 22 August. All sales of the posters will go towards the Little Sun project to provide more light where it is needed most. Legendary model/activist Naomi Campbell and iconic graphic designer Peter Saville have joined forces to create ten original artworks, with Naomi Campbell’s favourite inspirational quotes designed and painted by Peter Saville Studio on blankets provided by Woolrich. Little Sun’s solar solutions are for everyone: they benefit communities living off the electrical grid by working with local entrepreneurs, creating local jobs, and generating local profits. Artist Olafur Eliasson officially launched the Little Sun social business in July 2012 at London’s Tate Modern to bring clean, affordable solar energy to the 1.1 billion people living without electricity. Since then, more than 600,000 Little Sun lamps have been distributed worldwide, with more than half going to off-grid areas. Purchasing Little Suns in areas of the world with electricity makes the products available in off-grid areas at reduced, locally affordable prices, where they provide a clean alternative to toxic and expensive fuel-based lighting and a steadfast and clean alternative to relying on the electrical grid. Globally, Little Sun inspires people to take action. Through the power of creativity and art, the global project provides a way to make sustainable energy tangible and raises awareness for the UN Sustainable Development Goals – especially for energy access, good health and well-being, quality education, gender equality, and climate action. This entry was posted in ART, FASHION and tagged Little Sun project. Bookmark the permalink.